We went to covered dish get-together this weekend and were to take a White Elephant gift. As it turned out the White Elephant gift was really a Chinese Auction. There are various versions of a Chinese Auction. For this version those who participated drew a number from a hat. When that number was called, the person chose and unwrapped a gift. If they didn’t like it, they could swap with someone else. Obviously the first few people didn’t have much of a chance of swapping for a “better” gift. The gift we took was destined for our yard sale. Mr. Aitch was third to select a gift. It was a crystal candy dish with a lid and resembled a Hershey Kiss. I suggested he swap that for a canvas bag filled with gardening tools. Pretty and useful. Too pretty and too useful as it turned out. That gift was THE gift and exchanged hands many, many more times. After the last gift was unwrapped and swapped, the first person got an opportunity to swap since she didn’t have a choice at the beginning. BTW she was the one that opened the canvas bag with the gardening tools in the first place. And that’s what she ended up with after all. What did Mr. Aitch get? The gift we took. It’s going back to the yard sale box. 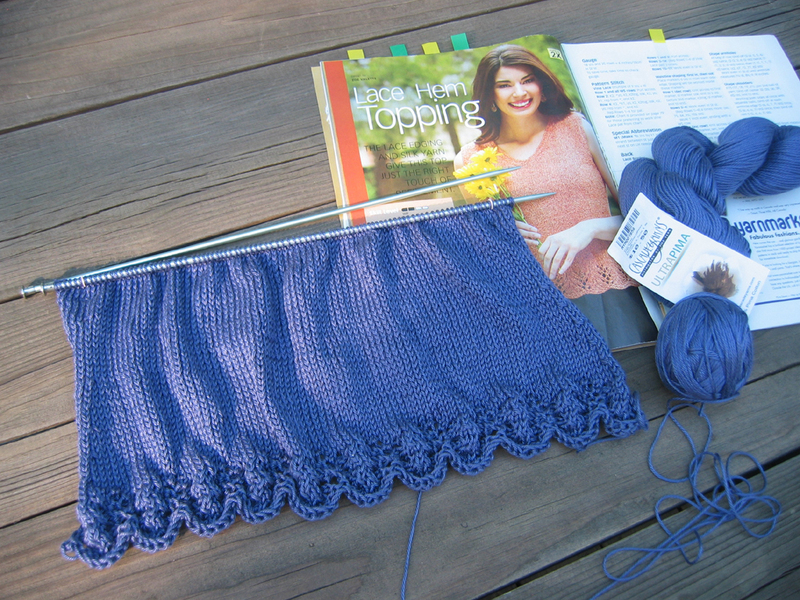 On the knitting side of the weekend I got about half way done on the back of the Lace Hem Top. I’m hoping I can make great progress on this today and perhaps even finish the back! Mr. Aitch doesn’t understand the concept of a “sweater” for the summer. I tried to explain that it isn’t a sweater, it’s a knitted garment. Not all knits are sweaters. Whatever. Cascade Ultra Pima in Heathered Pansy. This has a lace border and I’ve not really done much with lace. In fact the only “lace” I’ve done is/are the eyelet sweaters. I wet the sweaters when I was finished with them and blocked. I used acrylic yarn. How do I block this cotton? Steam block? Wet block? This entry was posted in cleaning, declutter, knit, pattern, yarn and tagged blocking, chinese auction, knitting, lace, Lace Hem Topping, pattern, sweater, yarn by Patti_is_knittinginflashes. Bookmark the permalink. I can’t wait to see this completed. The border is gorgeous. I haven’t knitted with the ultra pima yet, but I have felt it and it feels wonderful! As I type this I have about an inch left to knit on the back before I can bind off. I hope I can start on the front this evening and get a lot of knitting time in over the weekend.